Measuring the future together as one! 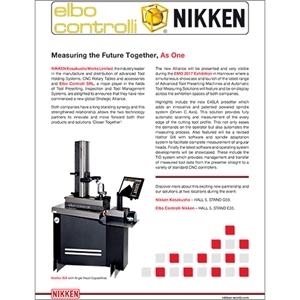 NIKKEN KOSAKUSHO WORKS LIMITED, the industry leader in the manufacture and distribution of advanced Tool Holding Systems, CNC Rotary Tables and accessories and ELBO CONTROLLI SRL, a major player in the fields of Tool Presetting, Inspection and Tool Management Systems, are delighted to announce that they have now commenced a new global Strategic Alliance. Both companies have a long standing synergy and this strengthened relationship allows the two technology partners to innovate and move forward both their products and solutions ‘Closer Together’. The new Alliance will be presented and very visible during the EMO 2017 Exhibition in Hannover where a simultaneous showcase and launch of the latest range of Advanced Tool Presetting Machines and Automatic Tool Measuring Solutions will feature and be on display across the exhibition spaces of both companies. Highlights include the new E46LA presetter which adds an innovative and patented powered spindle system (Driven C Axis). This solution provides fully automatic scanning and measurement of the every edge of the cutting tool profile. This not only eases the demands on the operator but also automates the measuring process. Also featured will be a revised Hathor SIX with software and spindle adaptation system to facilitate complete measurement of angular heads. Finally the latest software and operating system developments will be showcased. 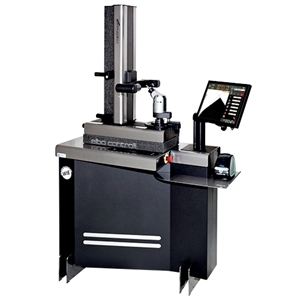 These include the TID system which provides management and transfer of measured tool data from the presetter straight to a variety of standard CNC controllers. Printable format of the announcement of the Global Strategic Alliance between Elbo Controlli and NIKKEN Kosakusho Works Ltd. on 18 September 2017.